Ironic that I have flowers in the above image huh? Like many hayfever really is the bane of my summer, constantly itchy eyes, a sore throat, sneezing more times than anyone would care to count and oddly in my instance a rash (hives I believe) as well as blocked ears. Forget about frolicking in a bikini on some summer shore I'd settle for non-streaming eyes. I won't recommend any brand of antihistamine over the other as frankly none of the over the counter versions work for me, I'm just that special but to combat constant sneezing I rate Hay Max (you can find it here via Boots - link). This is a balm that you apply at the entrance of your nostrils which acts as a barrier to trap any pollen. It is 100% natural and bizarrely works. I happen to have the Lavender version which works a treat come bed time but is not all that ideal for day time. Some have stated that petroleum jelly would do the same thing but I'm not all that keen to put such theory to test. Sorry! For tired, painful, itchy and generally irritated eyes I am partial to a spray or two of Optrex Actimist 2 in 1 Tired and Uncomfortable Eyes (you can find it here via Boots - link). At £15.99 it doesn't come cheap but it works and if you have unbearably itchy and irritated eyes you will happily hand over the cash for a few moments of relief. What I like about this mist is that you spray it over closed eyes for instant relief (it cools and calms) and the best part is that it doesn't remove eye make-up. I keep mine on me at all times. In the evening I prefer something a little more luxurious which happens to be Liz Earle Eyebright Soothing Eye Lotion (you can find it here - link). I soak a few cotton pads in the ultra refreshing yet hydrating and soothing liquid, lie back and basically bliss out. I find by doing so it reduces any puffiness and generally calms an area that is currently rather irritated. Basically to try is to love. A good eye gel in the morning and evening also works wonders, I haven't included mine in the shot as it looks a little grubby but Superdrug's Simply Pure Eye Gel (find it here - link) is refreshing, cooling, gentle and helps to keep puffy eyes at bay, at £4.59 it is also quite the bargain. Eye make-up can be tricky due to the constant eye streaming so basically I find less is more, heck on high pollen count days I just wear sunglasses. The best mascara for irritated eyes has to be Clinique Lash Power Feathering Mascara (find it here - link), this mascara was originally created for the balmy conditions of Asia and gently "tubes" the lashes so it doesn't flake, smudge or smear. You'd think with such technology that the lashes would be crispy and difficult to remove and yet it has to be the softest mascara I own yet it gives the impression of length and volume. 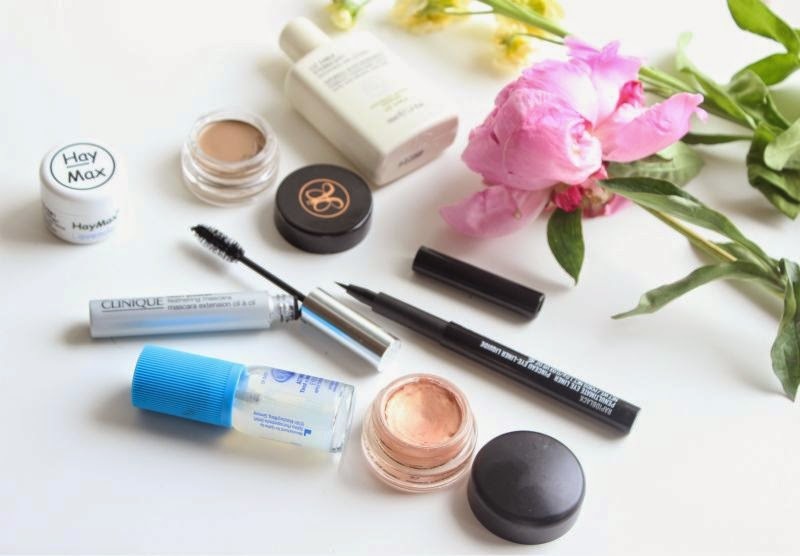 As for removing all you need is water - I kid you not, no tugging or pulling or fancy eye make-up remover. It is rather amazing and the only mascara anyone with sensitive eyes needs be it hayfever or otherwise. The only other eye make-up that I own and can hand on heart say won't budge even if you rub your eyes is MAC Paint Pots - a comfortable, beautifully pigmented, non-creasing yet long wearing cream eyeshadow that comes in a huge range of colours. Another MAC product that I can count on to stay strong is the MAC Penultimate Eyeliner, a finely nibbed liquid liner that is a breeze to apply but will not wilt even if my eyes water like no tomorrow. I doubt many people's eyebrows will be affected by hayfever but just in case or even if you are on the look out for a non-budging eyebrow product look no further than Anastasia Dipbrow Pomade (you can find it here - link). This is a gel come mousse that does take a little getting used to in terms of application but once you nail it there is no looking back (an angled brush, that is stiff and on the small side and quick brush strokes is what works best for me). This little baby can withstand heat, sweat, eye wiping and even rain. The rest of your make-up might melt off but trust me this is going no-where. If you have any other hayfever wonder beauty products please do share as this gal can become rather miserable each Summer. Oh life! im a hayfever stuffer myself, I feel your pain! last year I swore by hayfever tablets but there not working for me this year, my eyes are my biggest problem! they are not too bad sometimes, but they drive me bonkers as it makes me really panicky for some reason!